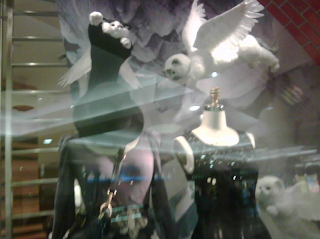 I love a great window display and always admire Lululemon window displays thanks to my Fine/Graphic Art background. It’s usually the way the outfits are arranged in color combinations that please the eye or sometimes they have a display that makes me think such as manifesto themes (controversial ones), environmental topics, community involvement or something political. This display from Aritzia stores pictured bellow has none of those things and yet it’s captured mine and my daughters attention over the past few weeks. Flying Kitty-Cats! Genius! Whenever were at the mall or strolling by this display we must stop and pst-pst at the kitties on the request of my toddler. And naturally I must stop in to browse around. The display has nothing to do with clothes, and no particular statement. It’s just enchanting, cute and a little bit strange. Here is the link to the Aritzia blog post about their Cat Display. I’ll have to think of a way to show my daughter that cats don’t actually have wings or fly by introducing her to actual cats since nobody in our family has a cat.